Most of us know the story of what Salon’s Elias Isquith calls “Wall Street’s favourite disrupter”. Uber, the ride-hailing service run primarily through smartphones, is a global economic success story. In 2008, it was but an idea held by Travis Kalanick and Garrett Camp. Today it is a profit-making “unicorn”. It was recently valued at US$62.5 billion. How Uber came to be worth such significant sums is a question often posed. Integral to its success was its speedy efforts at connecting riders with drivers through smartphones. This saw Uber become an on-demand disruptor business. In the process, it has alluringly branded itself as a service “for the good of all” that puts “people first”. 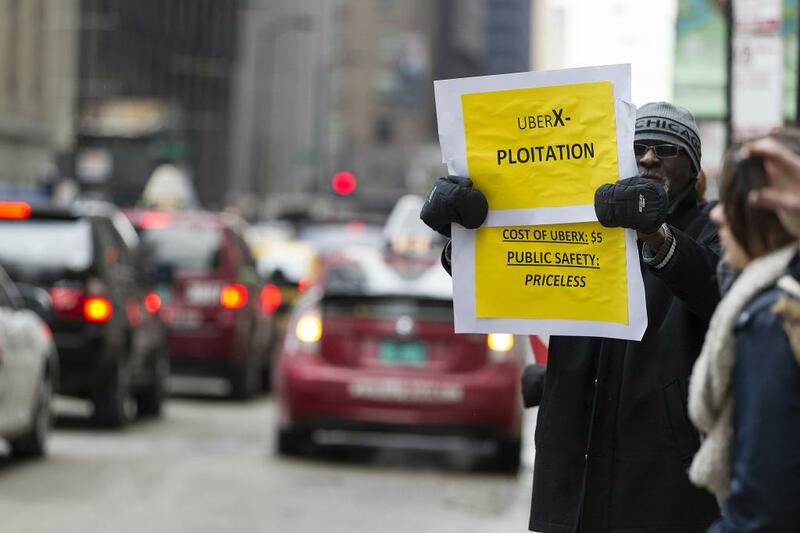 Uber seemingly takes from over-priced taxis, facilitates livelihoods for its drivers, gives to the needy rider and sticks it to urban regulators – or so the story goes. Much closer to the truth may be that when Uber isn’t wrapping itself in cloaks of communal good, it is busy trying to institute a monopoly on ride-hailing. It actively encloses what could be a more open city in which riders and drivers work to benefit city residents. Uber “opens” cities to “close” them. We think this way because Uber is just another intermediary capitalist (like eBay, Airbnb and PayPal) that profits from the needs of typically urban people connected to the internet. Uber is therefore an extension of capitalism and, because of that, can be understood as a business trying to maximise its market share. to exclude ride-hailing alternatives through its maximised market share. The marketing Uber uses to disrupt the grip one or more taxi companies have on a city is to present a rich rhetoric of being the “alternative”, somehow “grassroots” and, most importantly, a “communal” choice for drivers and riders. It casts itself as a Robin Hood in the struggle against unjust, or simply outdated, urban regulators. This branding, Uber’s cheaper price and its convenient app make it an alluring option for ride-hailers. So long, cabbie dynasty, this city’s now open. But because Uber grows within the shell of the taxi industry all it really does is open a city to enclose it for its own benefit. It does this through consistent marketing to riders, but also by enticing drivers to partner with Uber with promises of higher pay and a be-your-own-boss mentality. Uber also crows about creating tens of thousands of jobs and getting one million women into work. This helps to get regulators onside. A city is “closed” when Uber’s enclosure is complete: when it has successfully disrupted taxis, changed ride-hailing regulation and has a city’s residents on board (so to speak). We say closed because an “Uber city” is a city captured by intermediary (middleman) capitalism. Defeated taxis are creating their own apps, and alternatives abound. But Uber’s market dominance makes it very difficult for more meaningful alternatives to emerge. Market dominance means the exclusion of competitors and the control of the means of production so that profits keep rolling in. “Capture your market” is a mantra for a reason. And that reason is because it works – it’s Capitalism 101. A truly open city would be one where residents are invited, supported and backed by their city government to create their own ride-hailing apps. Riders still get picked up for a fair price, drivers still get paid more, but profit goes into a public trust to ensure the apps provide good service but also to fund resident-specific projects, like bike roads fully separated from cars. Not only will this keep jobs and money inside the city, but it also puts a vital transportation resource into the hands of city residents and not a foreign business. The need to get around a city safely, conveniently and with as little carbon emissions as possible shouldn’t be viewed as an opportunity for businesses like Uber to cash in. It should rather be treated as a common pool resource. Since the majority of people in cities still depend on cars and roads to get around, chasing the wrong incentives can lead to chronic traffic jams and a host of other problems. City residents don’t want traffic jams; moving around is a vital part of their daily lives. Uber doesn’t necessarily mind traffic jams because of surge pricing and a rolling meter – it still makes money. Ironically, despite this conflict of interests, Uber is the US$62 billion Wall Street poster child and the open-city alternative is excluded. Uber may open cities from taxi rackets, but it closes them off to the possibility of more radical and meaningful alternatives.